DURATION OF THE COURSE :- 4 calendar years commencing from 20th November of the academic year consisting of not less than 240 working days per year, including the university examinations. Minimum age : 17 years (completed) at the time of admission. Maximum age : Not more than 35 years (three years relaxation in case of widows, SC/ST candidates). Intermediate pass with Biology, Physics and Chemistry as optional subjects or Intermediate Vocational Nursing pass from the Board of Intermediate Education or any other examination recognized as its equivalent. Minimum marks – 45% obtained in optional subjects in Intermediate or its equivalent examination. In case of SC/ST candidates, minimum marks should be not less than 40%. Students applying for admissions under the Govt. quota must apply to the Dr. NTR & KNR University of Health Sciences (Dr. NTR & KNR U.H.S.) according to the newspaper notification in June/July. Those selected for admission under the govt. quota shall submit their selection intimation letter in the Administrative Office of PDSCON at the time of admission. Fee towards registration, examination and any other fee prescribed by the Dr.NTR. & KNR UHS shall be borne by the candidate. Students applying for admission under the Management Quota must submit their application forms along with a Demand Draft for Rs.1,000/- (subject to change) in favour of the “Princess Durru Shehvar College of Nursing” according to the admission notification in the newspapers (June/July). Applications will not be considered for selection if not registered with the Administrative Office of PDSCON. Fee towards eligibility, registration examination and any other fee prescribed by the Dr. NTR & KNR University of Health Science shall be borne by the candidate. Memorandum of marks of the Intermediate Examination or its equivalent. Conduct certificate from the Principal of the college last attended. Certification of local candidature or migration certificates (for students coming from other states). Note : All original certificates submitted for admission will be retained by PDSCON until the successful completion of the 4 year B.Sc. (N) course. 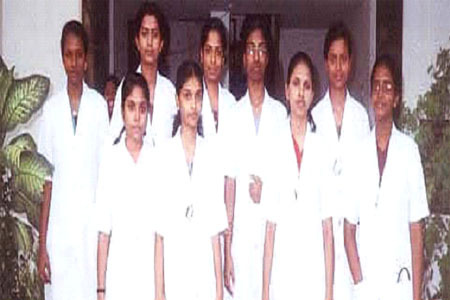 Board Examination are held by the NTR & KNR University of Health Sciences, (Dr. NTR & KNR U.H.S & KNR U.H.S.) at the end of each academic year (I, II, III, IV years). Internal assessment of all subjects is done by PDSCON and the assessed marks are added to the marks obtained by the candidate at the Board Exams. The degree in B.Sc. (N) is awarded by the Registrar, Dr. NTR & KNR UHS, Vijayawada, A.P. consolidating its commitment to excellence in education, PDSCON has the reputation of achieving 100% pass result at the Board exam each year since its inception. This year (2011), the institution has outdone itself as all the students passed their exams in the Ist division with distinction in one and more subjects. Meritorious students who achieved distinctions in more than one subjects at the Board Exams -2011.